AJ Moore strives for meaning in her life following the unexpected death of her beloved father. Her reporting career stalled, her love-life non-existent, and a family frilled with more conflict than love, she relies on her dear friend Stella to make it through cheerless days in sm... read full description below. AJ Moore strives for meaning in her life following the unexpected death of her beloved father. Her reporting career stalled, her love-life non-existent, and a family frilled with more conflict than love, she relies on her dear friend Stella to make it through cheerless days in small-town Bayside. While rock-climbing the seaside cliffs, AJ discovers a mysterious two-hundred year old sailing ship appearing through the fog. The mystery deepens when she can't learn any more about the ship than its single passenger, Captain Finn Murphy. So begins a fiery relationship that simultaneously warms her heart and angers her blood. And if that's not enough, AJ must decide what impact the second mysterious stranger to enter Bayside, Ethan Hughes, has on her life. While AJ attempts to get to the bottom of the ship's strange existence, Finn and Ethan seek an ancient stone necklace, lost in time. No one is less prepared than AJ to realize that she alone holds the key that unlocks everything. 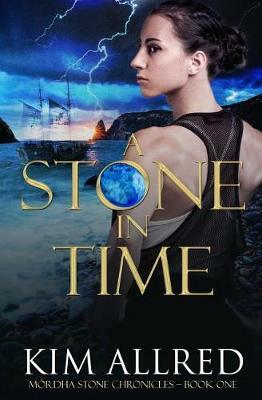 NOTE: A STONE IN TIME contains cliffhangers as AJ and Finn's primary journey continues in KEEPER OF STONES and concludes in TORC OF STONE. The first chapter of KEEPER OF STONES can be found at the end of A STONE IN TIME. I hope you enjoy the adventure.